Renovation and New Home. The energy efficient home renovation stream provides incentives that support energy audits and access to rebates. 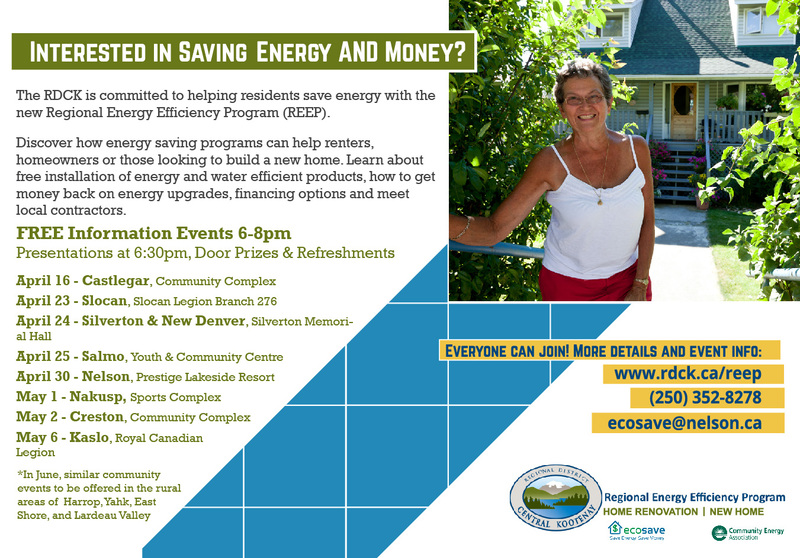 The energy efficient new-home education stream provides training and access to information for all new home builders.The program offers environmental and social benefits. utilities—BC Hydro, FortisBC and Nelson Hydro—Community Energy Association (CEA), and the Federation of Canadian Municipalities (FCM). A grant from the FCM’s Municipalities for Climate Innovation Program (MCIP) provides 71% of the funding for REEP. Nelson Hydro leads the Home Renovation program to offer EnerGuide home energy evaluations, retrofit incentives and rebates and with the goal to penetrate 3% of the existing housing stock or 774 homes. CEA leads the New Home program to offer education, training and workshops to builders and officials with the goal of 80% penetration. This supports the transition of building practice in our area to the new BC Energy Step Code, a component of the BC Building Code.